The Italian verb for bring near is the regular -ARE verb avvicinare. ... imagine saying, "I'VE ITCHIN' HARRY! Don't bring the dog near me!" Avvicinare is conjugated like thousands of other regular -ARE verbs. Avvicinare can also mean: to pull/draw up; to approach, to near. - avvicinaziarsi (vr) : to go nearer, closer; to come nearer/closer. - l'avvicinamento (nf) : approach; coming. Come closer and learn Italian with innovative memory techniques like Cartoon Memory Triggers. To remember a word, just think of the pic! 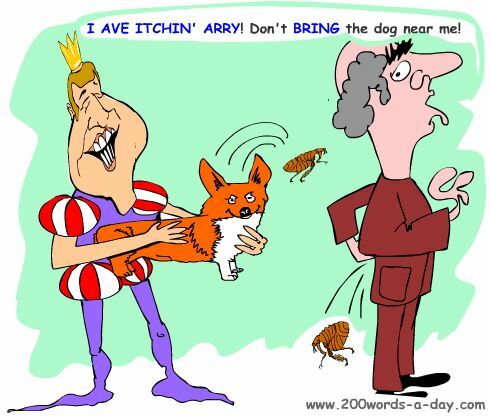 Imagine saying, "I'VE ITCHIN' ARRY! Don't bring the dog near me! non avvicinare! (non) avvicini! (non) avviciniamo! (non) avvicinate! (non) avvicinino! ✔ Avvicinare is a regular -ARE verb, these being the most common verbs in Italian. ✔ Learn avvicinare and it will reinforce the pattern for ALL those other -ARE verbs. ✔ You can more easily remember words and verbs like the Italian for bring near - avvicinare using the techniques of the world's Memory Masters. 200 Words a Day! Free Daily Italian Lesson Online - the verb in Italian for bring near is avvicinare - fully conjugated. Italian Learning Made Fun and Fast with your free Daily Italian Verb Lesson - avvicinare.